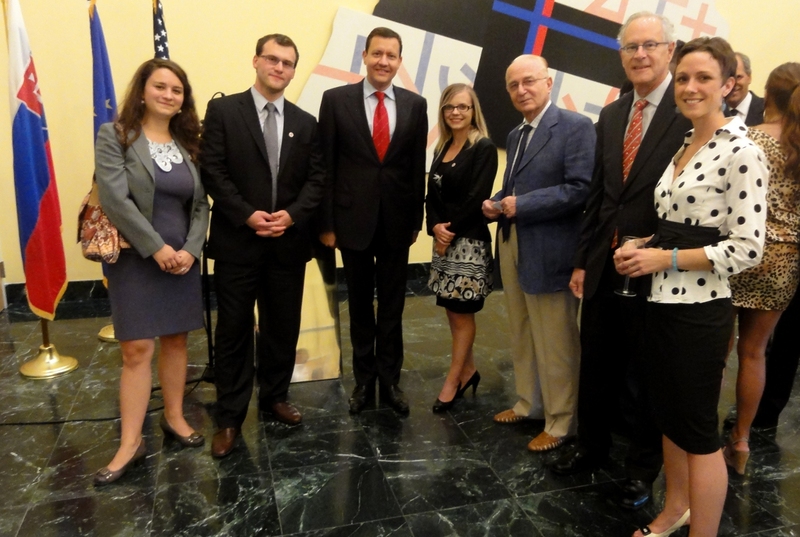 My inspiration for this dish came during a reception at the Slovak Embassy in Washington D.C. on the occasion of a visit of Slovakia’s Interior Minister, Dr. Daniel Lipšic. The embassy chef, Michal S., made a delicious concoction of rice, chicken and mushrooms, along with his usual fare of tasty cabbage halušky, strapačky. I had some chicken at home so I figured I should try to recreate his creation. I think I came pretty close. 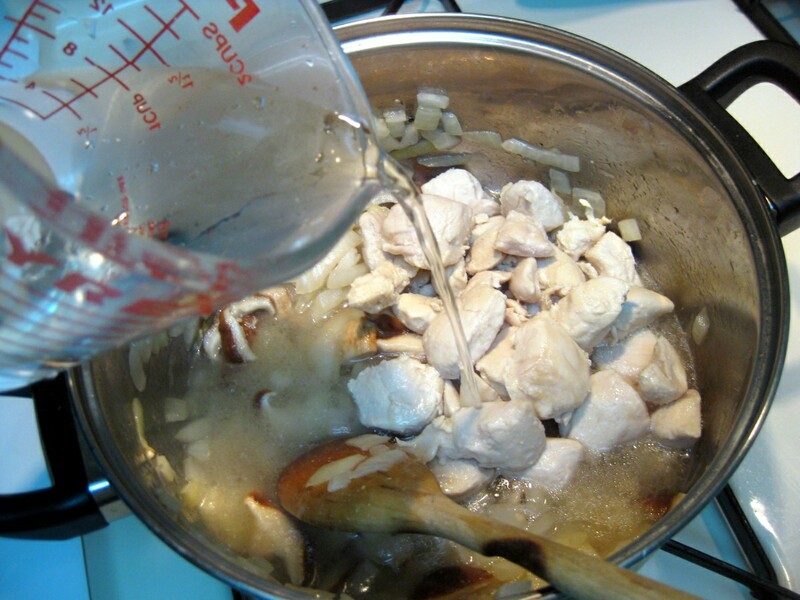 The ingredients: chicken breast, mushrooms, oil, paprika, rice, crushed red pepper, and onion. 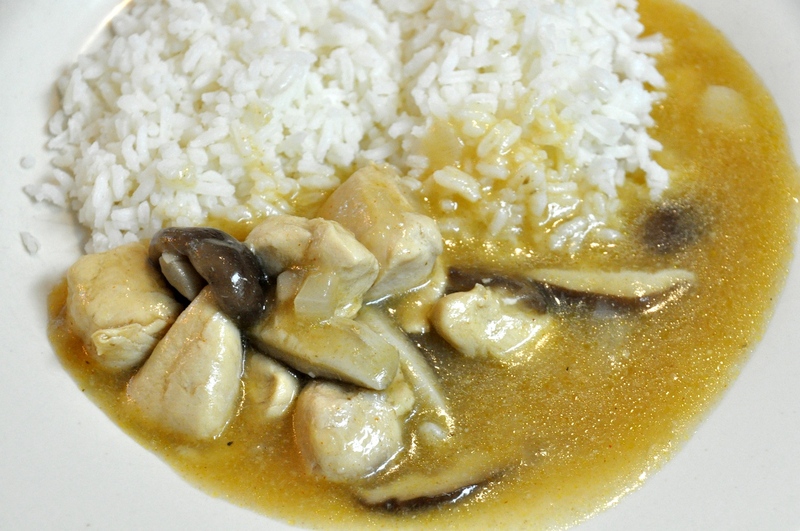 I used shiitake mushrooms just to try something different. In Slovakia, we love mushrooms (you’ll even find on them on Christmas trees)! Unfortunately, here in the US you are pretty much limited to the white button mushrooms and their older sibling, portabellas. Shiitake are the only other variety available in my grocery store, so I figured I’ll use, for a bit of variety. Start by cooking the rice. Bring 2 cups of salted water to boil. Also add a tablespoon of oil or butter into the water. 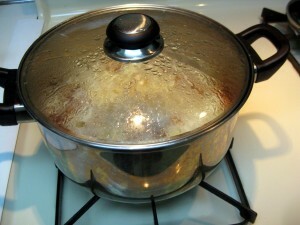 Then add one cup rice, reduce the heat, and cook covered for 15 to 20 minutes. Cube the chicken, slice the mushrooms, and dice the onion. 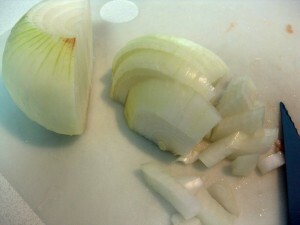 To cut the onion, first peel it and slice off the top and bottom ends. Then cut it in half. Next slice it in direction parallel to the end cuts. Assemble the slices together and then slice them in the perpendicular direction. This method is quick and takes advantage of the natural orientation of the layers. Heat up two tablespoons of oil in a pot and add the chicken. Fry it on all sides until no pink meat remains. 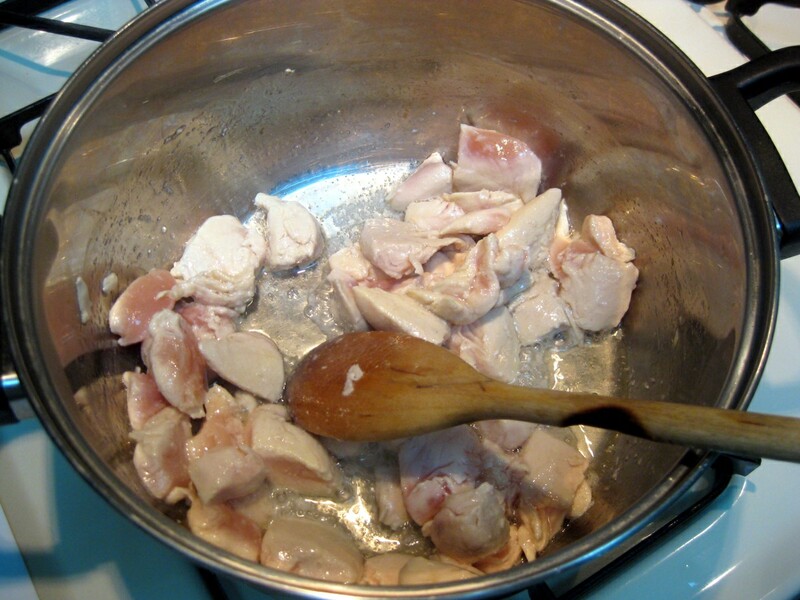 Then carefully spoon the chicken out onto a plate. 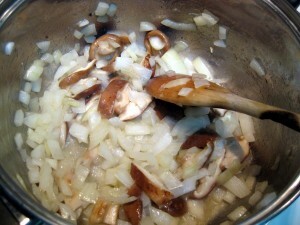 Add the onion and mushrooms into the pot and fry, stirring, until the onion turns golden. 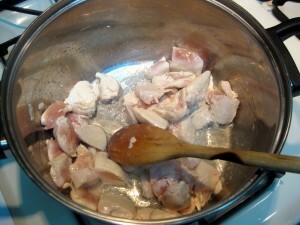 Add the chicken back into the pot, and add 3 cups of water. Also add a tablespoon of paprika and a teaspoon of crushed red pepper. 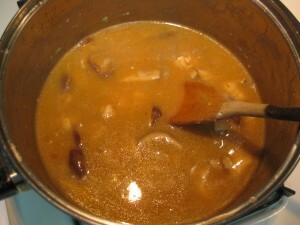 The paprika will give the stew nice brown color. 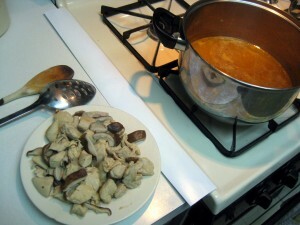 Cover and stew for about 20 minutes (until the chicken and the mushrooms are done). If you want, you can serve the dish like this. This is actually how it was served at the embassy, I think. But I decided to go one step further and blend the onion stew for sauce. To do this, first take out the meat and the mushrooms. 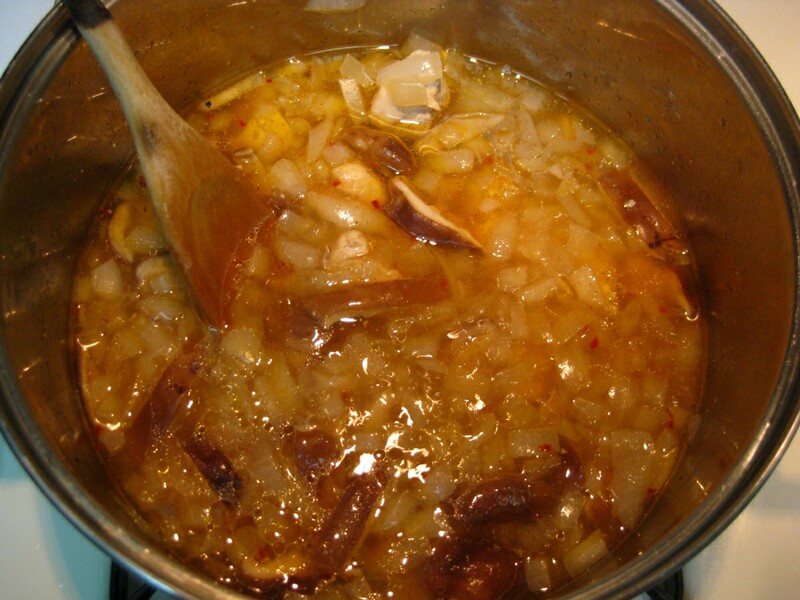 This is bit tricky, the easiest way is to remove the pieces using a spatula, and then return onions that also got scooped out back into the pot using your hands once the meat cools off a bit. Next transfer the onion stew into a blender and blend for few minutes. 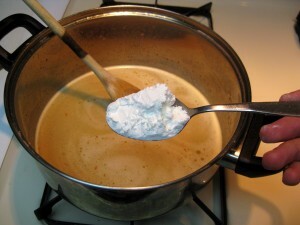 Transfer back into the pot and add two heaping tablespoons of cornstarch (or flour). Bring to boil and stir to dissolve the starch. Add the chicken and mushrooms back into the sauce to let them warm up. 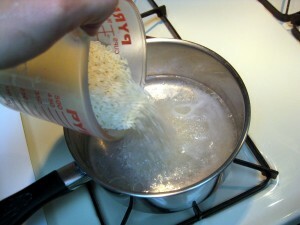 Serve with rice – fluff up the rice with fork before serving. And that’s it. It may not look like it, but this is a super easy and fast recipe for a tasty dinner. Dobrú chuť! And here are few photos from the reception. On the left, in the middle, is the minister with a couple of Slovak students attending the Georgetown University summer program thanks to a scholarship from Friends of Slovakia, along with my friend Martina. Martina (in white) is from my hometown of Banská Bystrica, and Veronika, the student all the way to the left in gray, is from Zvolen, the town right next door. And the second picture is of me and my girlfriend, Sandra. 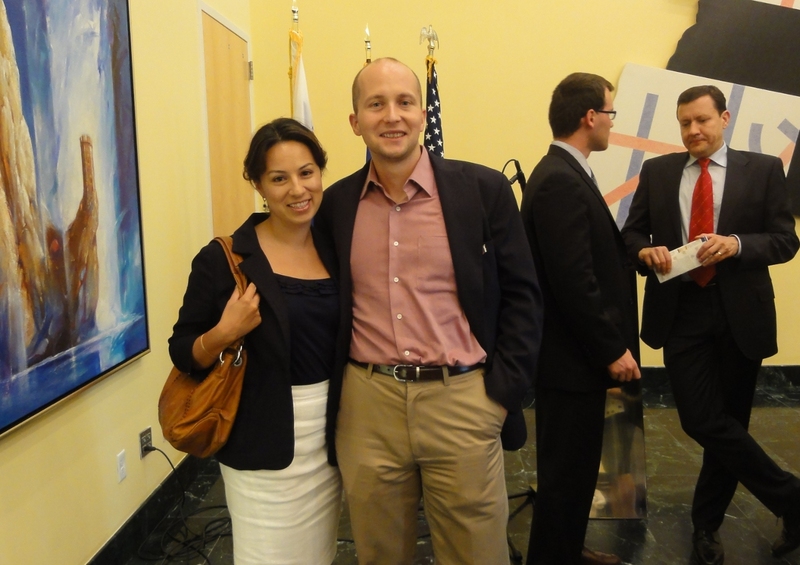 Sandra is from Colombia and this September will be her first trip to Slovakia. 11 comments - What do you think? Looks similar to my almost 98 year old motherinlaw’s recipe. will have to try it and have her sample. Interesting you are from Banska Bystrica – that’s where she’s from. Her maiden name was Kolembus and my son and his family just returned last night from seeing his great-grandparents homes in B.B. and Dobsina. I look forward to seeing their pictures and hearing stories of the wonderful food and people!!! Thanks for great idea-this is what I will make for lunch today! 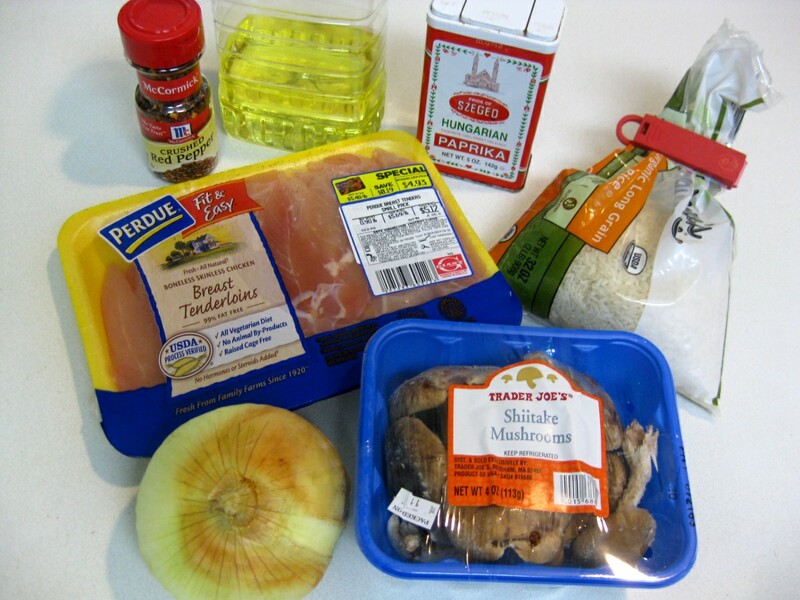 My daughter does not like chopped onions in anything: this makes cooking a little bit tricky as so many of our traditional recipes call for chopped and sauteed onions. So this is what I do: I chop onions ever so finely, using electric chopper, until they resemble a paste. So my first step in this recipe will be to “fry” this onion paste before adding chicken and mushrooms (a bit tricky as it has to be done on a really low heat). 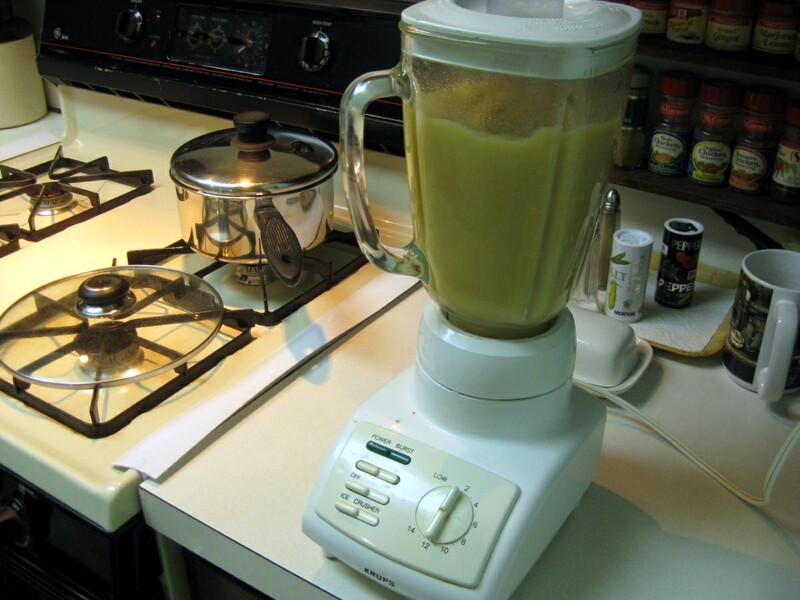 This way the sauce will be smooth and I can skip the blending. This recipe turned out great! My Slovak husband said it’s the best sote he’s had in the US so far – which is a big complement from a picky eater. I have an intolerance for onions (they make me physically ill) so I try to cook without them or just use onion powder. When I told this to my Slovak friends they looked at me like I was an alien, since so many Slovak recipes use onions. I skipped them all together in this recipe and just added one can of corn at the end. Because there was no onion, I skipped the blending altogether and just added flour towards the end and let it boil for a few minutes to get the flour taste out and make it a bit thicker. Hope this helps! I have tried it and it was really good! I will definitely make it again, thanks for the great idea. I think I am going to make this tonight! I like how you tied in the dish with a good back-story! Neat to read how you were inspired for the dish. I love onions so this would definitely be something I would probably enjoy. I made this tonight for dinner and it was really good. I used thighs instead of breasts, not sure how much of difference this made. Since the grocery store only had the white button mushrooms, I also added some dried morels, shiitakes and porcini. Just made this for dinner – DEELISH. Will be making it again, for sure. Thanks!